Kiai is a Japanese go term representing an attitude of aggressively parrying your opponent's plans and pushing ahead with your own. Often translated as fighting spirit, it has a positive sense, and can also be applied to individual moves demonstrating the kiai attitude. If a player demonstrates kiai superior to his opponent, he is kiai-gachi (winning at kiai); if inferior, kiai-make. Holigor: Interesting that the higher the level of the book, the more often the term kiai is referred to. Go Seigen uses it often, for example. It seems that good players strive to avoid being "kikashi'ed" (kikasare), being forced to do something. They are looking for the opportunity to find a counter for each move of the opponent's. Andre Engels: From the places where I have read discussion of kiai, it seems to be about 'not letting your opponent have their way'. 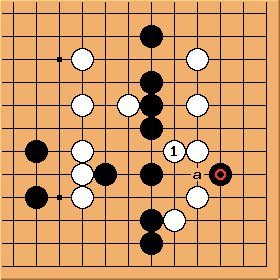 This is especially important with kikashi as HolIgor mentions - very good kiai is to take the opponent's kikashi, answer in an unexpected way, and either get sente or turn it into a thank you move. It applies to other situations also, however, for example if the opponent tries to make an exchange that secures territory on both sides, it is kiai to break through and counterattack. Maybe kiai is best understood as the opposite of submissive play? Just a guess. The example to the left is from Cho vs. Kato 1/17/2002. Responding to the peep with , instead of connecting at a, is kiai. kokiri: I thought it would be worth having an example with a more whole-board perspective. 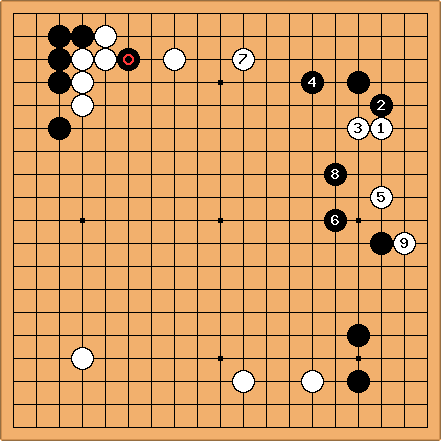 This is from the recent Honinbo match. Yoda Norimoto is White. Takemiya said that with move , Black would like to either strengthen the bottom right (as played) or approach across the top to bring to life . Yoda does not want to allow Black to get to play both spots. Hence, although locally clearly needs a reply, he wants to play with Kiai and so takes . Black follows up the attack with and White attaches at to secure the group. Emotional momentum when involving yourself in something in a concentrated mental way. Or, a shout showing such feeling. Technique for dealing with things. Or, mutual feeling. Breath. ki 気 means "spirit", "mood". ai 合い means "joint", "together", "gathering". (It appears in miai 見合い "looking together" or "looking at each other" and in semeai 攻め合い "attack together" or "attack each other".) Thus one could make a literal translation of kiai as "Charging/Gathering your Spirit", or just "Pumping yourself up" in laymen's terms. Fighting Spirit would normally be "Toushi (闘志)"
I try to apply these similar applications to my Go game. Kiai in your attacks may cause your opponent to play slow and heavy in defense. If you have sente, they may be too busy defending to attack you. Follow-through with attacks gains points and possibly more forcing plays. Zengarden Kiseido have published an interesting study of Kiai "Fight like a pro: the Secrets of Kiai" by Rob van Zeijst and Richard Bozulich (2012, "Mastering the Basics, Volume 8, K78). The book consists of four short introductory essays followed by detailed commentaries of 16 recent professional games, where Kiai is strongly exhibited.